Guadeloupe has been called Paris in the Caribbean, and French influences certainly permeate many aspects of island life. But the island is also rich in the flavors of the Caribbean, from the bracing toddies served at corner rum shops to the savory fruits proffered at open air markets and the rich chocolate confections crafted from native brown cacao crops. Island tours provide an ideal way to sample the history and culture of the islands through a sensuous combination of sights, sounds and tastes. Whether walking through lively village streets, touring country lanes or gliding between island by ferry, Guadeloupe serves up a rich menu of unique cultural experiences. Guadeloupe is actually a collection of islands, each with a distinct personality. The bustling townships and fields of Grande-Terre are contrasted by the forest-clad mountains of Basse-Terre. Iles des Saintes is a collection of postcard-perfect harbors and beaches, while quiet Marie-Galante is a reminder of the Caribbean of yesteryear. Traveling on and between islands is made easy by a network of good roads and reliable ferry service. Beyond those directly involved in the hospitality industry, relatively few of Guadeloupe's residents speak fluent English. To fully enjoy your visit, get familiar with a few common French phrases, and consider one of the translations apps now available for smartphones. Learning how cocoa beans are grown and processed and sample some delicious artisanal chocolates at La Maison du Cacao in Pointe Noire. Catch a ferry to the island of Les Saintes for a visit to Fort Napoleon and a taste of the famous pastry known as the Tourment d'Amour. Shop like a local at the market in Sainte-Anne. Take in the historic Colonial-ere buildings of Pointe-a-Pitre. Cap off a tour of the Damoiseau Rum distillery in Le Moule with a tasting of the end product. Keep clothing light and airy to provide the right balance of sun protection and cooling comfort. Swimsuits are for the beach; shirts and blouses are more appropriate for general wear in a culture that is relaxed and easy going, but still somewhat conservative in terms of dress. SAINT-FRANCOIS, GRAND-TERRE - CARADONNA RECOMMENDS includes 5 nights accommodations, Discovery of Petite Terre Natural Reserve of La Desirade- half day excursion on board a catamaran including snorkeling and BBQ, island hop to Les Saintes including transfers, ferry tickets, maps, restaurant reservations at Au Bon Vivre restaurant, Fort Napoleon entrance fee and transfers fort/harbour), one half day tour to Damoiseau Distillery for rum tasting, breakfast daily, roundtrip airport transfers, hotel taxes and service charges. Valid 5/1/19-10/20/19. 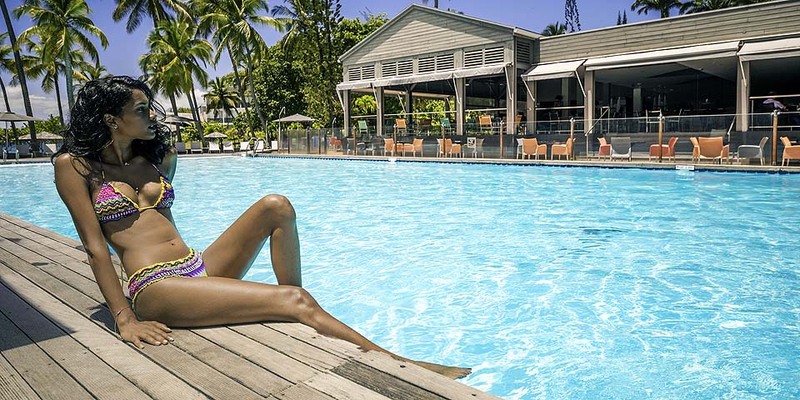 GOSIER, GRANDE-TERRE - BUILD YOUR OWN PACKAGE includes 7 nights classic accommodations, breakfast daily, roundtrip airport transfers, hotel taxes and service charges. Options to add-on shopping tours, rum tour, snorkeling tours, spa treatments, whale watching and kayak tours. DESHAIES, BASSE-TERRE - BUILD YOUR OWN PACKAGE includes 7 nights Bungalow Garden View, breakfast daily, roundtrip airport transfers, hotel taxes and service charges. Options to add-on Shopping Tours, Rum Tour, Snorkeling Tour, Whale Whatching Tour, Ziplining, Volcano Hike and Kayak Tour of UNESCO World Biosphere Reserve. 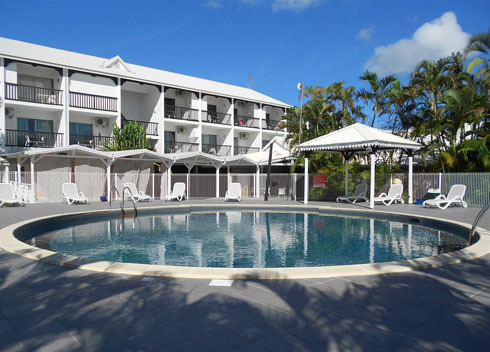 SAINT-FRANCOIS, GRAND-TERRE - BUILD YOUR OWN PACKAGE includes 7 nights Garden Marina Suite accommodations, breakfast daily, roundtrip airport transfers, hotel taxes and service charges. Options to add-on Shopping Tours, Rum Tour, Snorkeling Tour, Whale Whatching Tour, Ziplining and Kayak Tour of UNESCO World Biosphere Reserve. 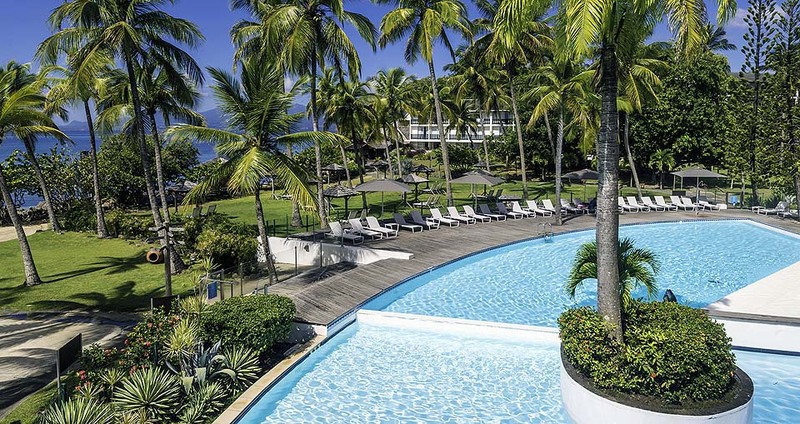 SAINTE-ANNE, GRAND-TERRE - La Toubana Hotel and Spa overlooks the Caribbean with sweeping views of the islands of Les Saintes, Marie Gallante and La Desirade. The property offers a small protected beach and 32 bungalows with either kitchen or kitchenette and private terraces or balconies. There are two restaurants, one beachside, and a spa. Diving services are available from Noa Plongee in nearby Saint-Francois (about a 30 minute drive). 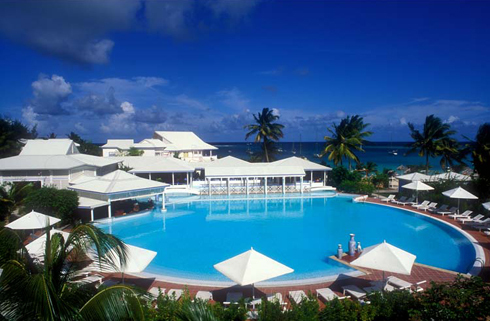 SAINT-FRANCOIS, GRAND-TERRE - Bwa Chik Hotel and Golf is a small and elegant hotel located between an 18-hole Robert Trent Jones golf course and the marina from which Noa Plongee Diving departs daily to dive sites nearby. 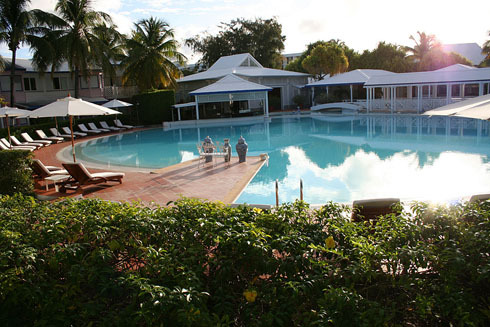 The resort features a swimming pool with a pool bar which also serves Continental breakfast daily. A variety of local restaurants and bistros are nearby for lunch and dinner. 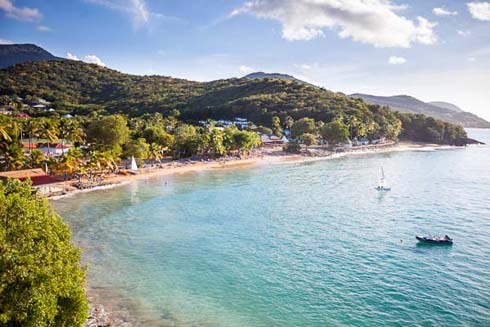 SAINT-FRANCOIS, GRAND-TERRE - La Cocoteraie is located on a protected bay adjacent to the Saint Francois Golf Course (a Robert Trent Jones designed course) and next the marina from which Noa Plongee Diving departs daily. The resort offers 52 suites, each with separate living room, bedroom and terrace. The property also has a beautiful beach, a large swimming pool, restaurant and bar, massage services, lighted tennis courts and a gym. 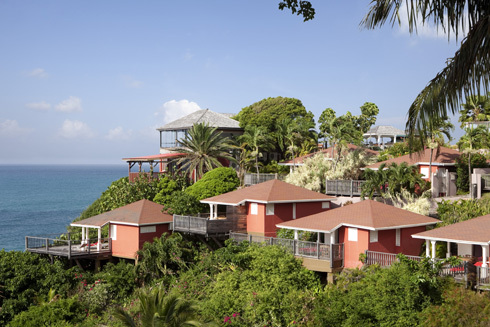 DESHAIES, BASSE-TERRE - Langley Resort Fort Royal is located on the north end of the island and offers a beautiful beach, 133 rooms and 82 bungalows and two restaurants. Restaurant Le Royal serves a mixture of Creole and international cuisine and Kawann Beach Bar offers more casual dining. Activities include tennis, biking, sailing, jet skis, standup paddleboards and more. Diving is with nearby Tropicalsub Diving. Entry Requirements: U.S. citizens must have a valid Passport and a return or ongoing ticket. Passport must be valid for 6 months beyond date of entry and 1 page required for entry stamp. No vaccinations or preventative medications are required for travel to Guadeloupe Islands. Yellow Fever is not a problem here. Check with the Centers for Disease Control on recommended vaccinations for travel at cdc.gov. The Guadeloupe Islands are a department of France, but they are also very much a part of the Caribbean. In bustling Pointe-à-Pitre, a stroll along Rue Frébault provides boutiques stocking perfumes, haute couture and delicacies straight from Paris. The scene shifts at Rue Duplessis when shoppers are immersed in the sights, sounds and scents of the St. Antoine Spice Market. In this open-air celebration of micro-capitalism, animated vendors hawk handicrafts, seafood and produce, and the smells of exotic spices permeate. Similar dualities abound across the islands. One can linger over buttery croissants and cafe au late at a sidewalk cafe, or duck into a corner rum shop for a bokit sandwich washed down by a Ti Punch. A local favorite, bokit is similar to fried naan bread stuffed with delicious hams and cheeses. Guadeloupe's dining scene is among the most celebrated in the Caribbean, with island chefs drawing on both French and Creole traditions. Lively dance traditions such as zouk, quadrille and toumbélé are enjoying newfound popularity in a culture that celebrates its roots, but also enjoys fusion jazz and dancehall music. The islands also support a vibrant arts community and have produced some of the region's most respected writers. For an immersion in island culture, plan a visit to the lively market days staged on alternating Sundays at the towns of Le Moule, Sainte-Anne and Saint-Claudeon. 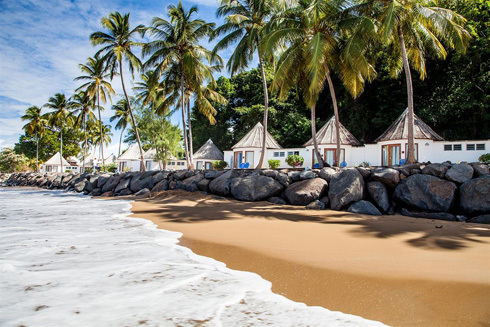 Grande-Terre's magnificent beaches host a number of upscale hotels, while the green slopes of Basse-Terre are home to nature preserves and parks where hiking trails lead to hidden waterfalls. Harbors on the island's western shore are launching points for whale watching excursions, and as many as 15 species of marine mammals are known to frequent the area. A network of excellent roads facilitates land travel while an efficient ferry system making island hopping easy. Favorite destinations include postcard-quaint bays of Les Santes and the quiet island of Marie-Galante, which provides a glimpse of old-school Caribbean life. When on Les Saintes, be sure to try a Tourment D’Amour -a pastry that resembles a height- challenged cupcake flavored with coconut and tropical fruits. Electricity is 220 Volt, 50 cycle with European standard wall plugs. U.S. appliances will require an adapter. WiFi is available at many hotels. Guadeloupe Island's country/area code is 590. It is recommended that you check with your local provider to see what data plans are available or roaming charges will apply. The water is safe to drink Guadeloupe. Many brands of local and imported bottled water is available for purchase at most restaurants and stores if preferred. French is the official language of the Guadeloupe Islands. You will hear locals speaking Creole. While at the hotels and tourist areas, English may be spoken, but outside of these areas very little English is spoken. A French translation book is recommended. The Euro is the currency in the Guadeloupe Islands. U.S. Dollars and sometimes traveler checks may be accepted. It is a good idea to rely on your credit cards for purchases. Please let your credit card company know that you will be travelling out of the country to make sure your card is available while on vacation and see if they charge any foreign transaction fees due to the currency exchange. Guadeloupe Islands is on Atlantic Standard Time (AST) and does not observe Daylight Savings Time. Guadeloupe Islands are 4 hours behind Greenwich Mean Time (-4 GMT). Guadeloupe Islands are located in the Leeward Islands of the Caribbean and are part of the Lesser Antilles. The islands encompass nearly 630 square miles including the 2 connected main islands of Basse-Terre and Grand-Terre and the smaller islands of Les Saintes, Marie-Galante and La Desirade. The population of the Guadeloupe Islands is 470,755 (2016).